A voucher code will be emailed to you. This code can be used when you contact us to book your driving lessons (if you haven’t already). By purchasing driving lessons on this page, you are agreeing to our terms. In our experience, many learner drivers will under estimate the theory test with statistics showing that there’s a 50% chance of failure. Delaying and not studying sufficiently for the theory/hazard perception test early enough is the single biggest reason that learning to drive takes longer than expected. You can not book a practical driving test until you have passed a theory/hazard perception test. 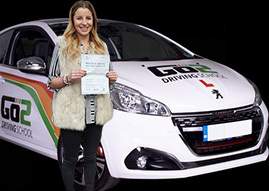 This then starts a two year time period in which you must pass your practical driving test. Failure to do so would mean taking the theory test all over again. We offer a 100% Money Back Guarantee on all of our driving tuition should you feel that we have not lived up to your expectations with either the service we offer or the quality of the tuition. This page is secured by 128-bit encryption. Your payment details are handled by our trusted payment provider, Stripe, and secured by 256-bit encryption.